It is a joy to nominate you, and I am thrilled that you are listed amongst all the other inspiring educators on the Edublogs Awards shortlist. 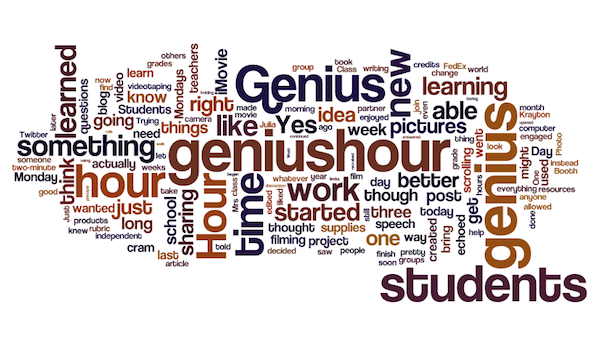 Today I was involved in an administrative discussion on grading ideologies and we got to the point in the discussion where motivation was the focus… and the grade is not the motivation, the creating based on their interests are… and I thought of your Genius Hour. I realized that to be at a place where one is implementing a genius hour in their class is because the teacher is a true learner who understands motivation… and understands what a 21st century learner is. You understand this, and you share it in your blog. So, I thank you for that because it helps me and it helps others see this. What I love about your being on the Edublogs Awards shortlist is the awareness it is raising amongst other educators and communities. On a personal level, I know that I won’t get many votes, shoot, I’m not even voting for myself — however, that’s not the point. The point is the awareness that awards like this raises for how blogging and web2.0 tools helps our learners… and what our learners need and what motivates them. I hope that awareness is heard. Every time we tell someone about the awards, we are essentially telling them what our learners need. So, I thank you for your humbleness in writing this post. I thank you for sharing the message. As always, thank you for your thoughtful and inspiring comments! You are on an illustrious list of Best Individual Bloggers, and I count it a privilege to vote for you! I agree, these awards are a great way to build our PLN. I have met some amazing tweeters when I went through the list and followed everyone who was new to me! They made it so easy on the nomination page to click and follow. Who knows who the best one is, and, as you said, it really is not the point. I am also reading new blogs every day. It is amazing how many people are sharing, reflecting, growing, and inspiring! I’m blessed to be a part of it with them–all of them.